Need a short URL to tweet? tinyurl.com/newoldpens will bring you right here. This group of Montblanc limited editions were consigned to us by a longtime collector. They are one-owner pens, nearly all unused, including some of the earliest and most desirable models. 13933: Montblanc Lorenzo de' Medici: Montblanc's legendary first limited edition, one of 4810; pen still sealed in plastic sleeve, complete with all original packaging. 13940: Montblanc Octavian: limited edition of 4810 pieces, lightly used, with all original packaging. 13941: Montblanc Agatha Christie: limited edition of 30,000 fountain pens, black piston-filler with sterling silver trim, all original packaging. 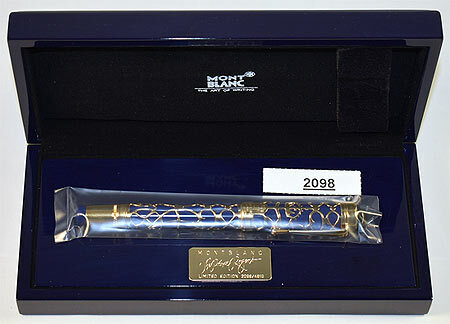 13934: Montblanc Oscar Wilde: limited edition of 20,000. Original packaging, box has not been opened, seals are unbroken. 13932: Montblanc Louis XIV: limited edition of 4810 pieces, original packaging minus white outer sleeve. 13918: Montblanc Oscar Wilde set: complete three-piece limited edition ensemble (only 5000 made) comprising fountain pen, ballpoint, and mechanical pencil. Original packaging, box has not been opened, seals are unbroken. 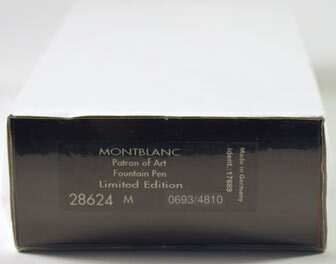 13936: Montblanc Prince Regent: limited edition of 4810 pieces, unopened package with shrink-wrapping intact. 13938: Montblanc Prince Regent: limited edition of 4810 pieces, unopened package with shrink-wrapping intact. 13937: Montblanc Prince Regent: limited edition of 4810 pieces, unusually low number; complete with all original packaging except outer sleeve. 13920: Montblanc Prince Regent: limited edition of 4810 pieces, complete with all original packaging. 13917: Montblanc Voltaire set: complete three-piece limited edition ensemble (only 5000 made) comprising fountain pen, ballpoint, and mechanical pencil. Original packaging, box has not been opened, seals are unbroken. 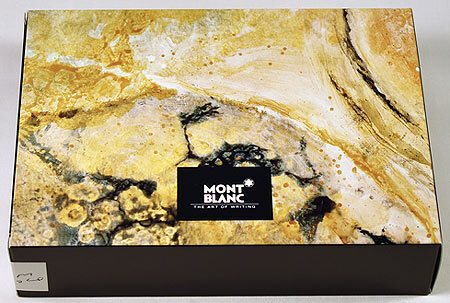 13935: Montblanc Semiramis: limited edition of 4810 pieces, unopened package with shrink-wrapping intact. 13919: Montblanc Alexandre Dumas: limited edition of 15,000. Original packaging, box has not been opened, seals are unbroken; this is the scarce first release with incorrect facsimile signature, most of which were recalled. Comes with original Pen World letter of recall notification dated Sept 27, 1996. 13939: Montblanc Franz Kafka ballpoint: limited edition of 12,000 pieces plus 4,500 sets; as new, noting rubs to a couple of the book-shaped box's corners, no outer sleeve. 13963: OMAS Marconi 100 Anni di Radio in box: limited edition of 2800 pieces, sterling silver with rolled gold trim, 13.8 cm long, 18K gold nib; with all original packaging, some warpage to box (see details). 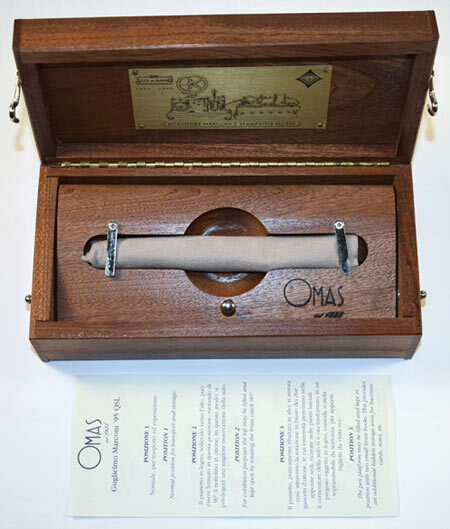 13964: OMAS Marconi 100 Anni di Radio in box: limited edition of 340, 18K solid gold cap and barrel, 13.8 cm long, with all original packaging. 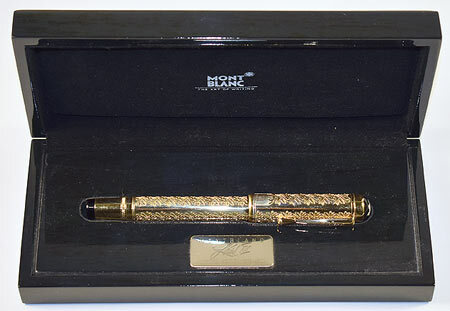 Over 55 grams of 18K gold in this pen, original retail price was $4800. 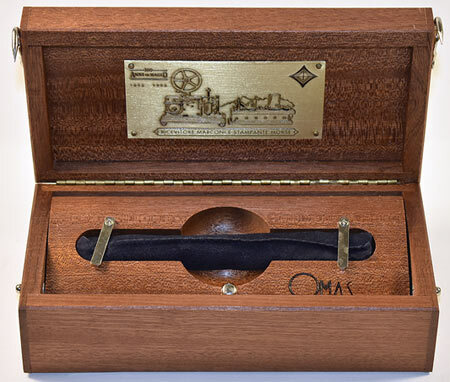 13965: OMAS Marconi 100 Anni di Radio in box: limited edition of 154 pieces, charcoal grey with rolled gold banding, 13.8 cm long, 18K gold nib, very scarce version dedicated to the Italian Navy cruiser Carlo Alberto, used by Marconi for his early radio experiments; with all original packaging. 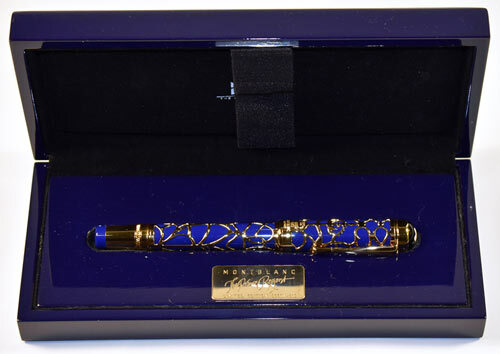 13959: OMAS 360 Vintage in box: limited edition of 360 pieces, transparent blue piston-filler, 15 cm long, rose gold plated trim, 18K nib; mint in box with ink bottle, all papers, outer sleeve, the first of OMAS's 360 Vintage series; two available. 13979: Parker 51 desk set: black Vac-filler, 15.6 cm long, good imprint with 4th quarter date code, name on barrel; glossy black base in modernist style, Magnetix swivel joint, a couple of tiny edge chips. 13974: Parker 61 Classic: red USA-made capillary-filler, 13.5 cm long, frosty Lustraloy cap; early white-colored pad, unstained, in end of uninked capillary filling unit (pen cannot be returned if inked). 14002: Sheaffer oversize Lifetime Balance set: grey striated plunger-filler, 14 cm long, chrome plated trim, with matching .9 mm pencil; doubly unusual, with wide fancy milled bands, pen barrel with two large side windows (transparency outstanding); smooth two-tone Lifetime nib with classic Sheaffer turnup tip; names on barrel, clips show some typical age porosity to the plating, barrel imprints crisp. 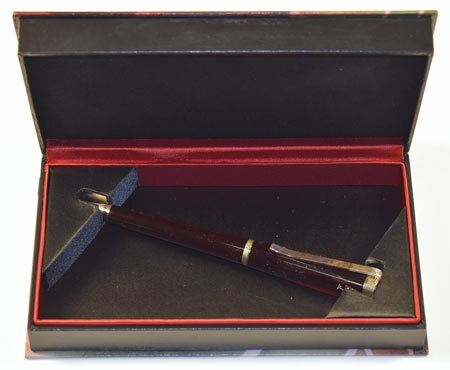 13986: Waterman pencil: black hard rubber ringtop, 9.9 cm long, gold filled trim, "PAT. APL'D FOR" imprint, barrel band engraved with name, uses 1.1 mm lead, matches 52 1/2 V or 42 1/2 V pen. Moderate browning, blotch on barrel (see detail). 13985: Waterman pencil: black hard rubber with sterling silver "Filigree" overlay, large thick model, 13.8 cm long, matches 455 or 456 pen; uses 1.1 mm lead.